These recipes are easy to make and easy to follow, even if you have never cooked or baked before. Are you new to preparing food, looking for some easy and simple recipes to follow? As my classmates were getting engaged and married, a number of my friends put together their favorite recipes into a custom-made cookbook, which we presented to the new brides as part of their wedding present. Each person chose their own recipes to share. On this page, I will share a couple of recipes with you: Sweet Spare Ribs, and Mikee's Brisket. They both taste delicious, and are very easy to make. If you like them, comment below, and come back later- I might add more recipes to this page! Simple, Easy, and Delicious: Sweet Spare Ribs! Combine ketchup, sugar, vinegar, soy sauce and water. Spoon it over the meat. Bake for a half hour, covered, at 350 degrees. Uncover the meat and bake another half hour, and then serve. Before you start, assemble all of your ingredients. Second cut brisket is a fairly common cut of meat, but you may have to ask the butcher to order it for you in advance. Slice the onions into rings, and place them on the bottom of a pan that is large enough to accommodate your brisket. Place the brisket, carrots, and potatoes in the pan, and cover them with the garlic salt. (Garlic salt is exactly that- garlic mixed with salt). 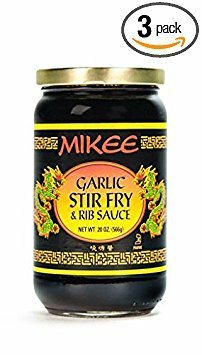 Pour on the mikee sauce. This is a delicious recipe for a special weekday or holiday meal. The meat is similar to corned beef, but this recipe gives it a very different flavor. I got this brisket recipe from my neighbor, years ago. She had it handwritten on an index card, titled "Joel's Brisket". Since then, I have shared it with my newlywed friends, as mentioned above. It is delicious! When you slice it in the second part of the recipe, it may be very soft, and therefore, it won't slice into even slices. That's ok- the meat could be sliced into chunks of various sizes, and mixed. 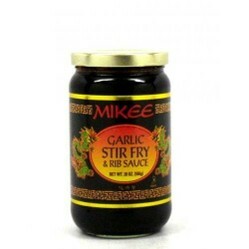 MIKEE Garlic Stir Fry & Rib Sauce Gluten Free 20 Oz. Pack Of 3. How Easy and Delicious Was that? Want some more? Comment below! I like fast, easy and tasty recipes. We are living in fast times! This is a quick 30-minute dinner with very few ingredients. The trick is to use flavorful foodstuffs which go well together and make the bland zucchini appetizing.